For his eleventh birthday, Emilio Estevez's parents gave him a portable movie camera, and for years he fancied himself a director, putting together backyard movies starring his brothers, sister, and friends Chris and Sean Penn and Chad and Rob Lowe. 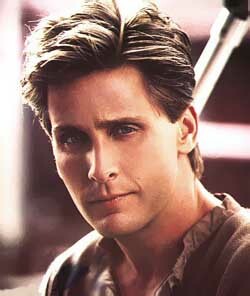 The firstborn son of Martin Sheen, Estevez chose to use his real name when he went into show business. At 18, he played a rebellious teenager in an episode of Insight, a long-running Sunday morning anthology of Christian-themed short stories. After a few forgettable TV movies, he made his feature film debut as Matt Dillon's motorcycle-riding friend in Tex, and within a few years he was a full-fledged member of the so-called "Brat Pack" of young Hollywood stars. He shared detention time with Anthony Michael Hall, Judd Nelson, Molly Ringwald, and Ally Sheedy in the quintessential '80s angst drama The Breakfast Club. He was in the top-notch ensemble The Outsiders with C. Thomas Howell, Ralph Macchio, and Patrick Swayze, the GenX western Young Guns with Dermot Mulroney, Lou Diamond Phillips, and Kiefer Sutherland, and the yuppie drama St. Elmo's Fire with Andie MacDowell, Andrew McCarthy, and Mare Winningham. In less crowded casts, he played a cop on a Stakeout with Richard Dreyfuss, a family man whose night out with the boys went wrong in Judgment Night with Denis Leary, and a kids' hockey coach in The Mighty Ducks and its sorry sequels with Joshua Jackson. In 1996 he was briefly seen as one of the doomed members of the IMF in the first Mission: Impossible film with Tom Cruise. In his best performance, he starred as the punk rock space-alien-chasing Repo Man with Harry Dean Stanton, and in his worst he was Razzie-nominated for Maximum Overdrive co-starring Pat Hingle and Yeardley Smith, in which space aliens used 18-wheelers to wreak havoc. In recent years Estevez has worked infrequently as an actor, and grown more interested in working on the other side of the camera. His career as director began blandly with Wisdom co-starring Demi Moore, with Estevez as a bank robber with a heart of gold, and then the garbage comedy Men at Work co-starring his brother, Charlie Sheen. His 1996 drama The War at Home was a very effective look at the Vietnam war's impact on an average American family, and Rated X for Showtime told the true tragedy of pornmeister brothers Jim and Artie Mitchell. His latest film was the well-received Bobby, a complicated and effective story written and directed by Estevez, telling how Robert Kennedy's assassination affected those who saw it.